I first tasted pastilla in Fes at a formal, touristy kashbah. It’s a meat dish wrapped in flaky pastry, topped with cinnamon, powered sugar and crushed almonds. I don’t know if the first one I ate was made with pigeon (it usually is). Crunchy on the outside and moist on the inside. It was a blend of savory-sweet — a common culinary combo in Morocco. I learned this version from Mamass in Tinghir. She prefers chicken. 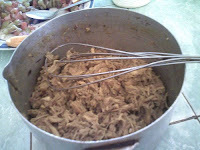 In a pot, place the chicken and onions with a little oil. Add salt, pepper, tumeric, ground ginger, cinnamon and fresh parsley. Add enough water to almost cover and mix well. Upon boil, add crushed garlic. Add a squeeze of lemon juice. While the chicken is cooking, blanche almonds. Deskin and toss skins. Fry almonds in oil until browned. Drain from oil, pat dry. Grind almonds. Once cooked through, shred chicken. Scramble eggs. Add powdered sugar and almonds to eggs. Mix well. Add egg mixture to chicken. Reheat until mixture is dry. 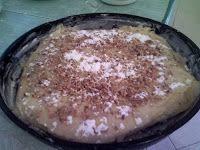 Butter and flour baking dish. 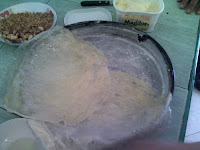 Separate dough sheets and create bottom of pastila. Overlap the sheets, letting them fall over the edge. Place chicken mixture on top of dough and spread evenly. 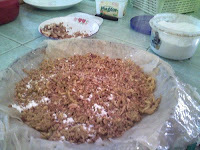 Add ground almonds. Dust chicken with powdered sugar and cinnamon. Place last pastry sheet on top of chicken. Using flour and water, brush the edge of the top sheet to seal the edge. Fold the overlapping dough sheets back into the center. Brush the top and edges with egg yolk. Sprinkle top with crushed almonds, powdered sugar and cinnamon. Bake for 15-20 minutes until top is browned.